As the Trump administration in the United States announces its decision about the US participation in the Paris Agreement on climate change, findings from the 2017 Lowy Institute Poll show that the majority of Australians see global warming as a serious problem and a critical threat to Australia’s vital interests. Over the past five years there has been a very clear turnaround in Australian public opinion on climate change. A majority of Australian adults see global warming as a serious problem that needs to be addressed, regardless of cost: 54% of Australian adults (up 18 points since 2012) say ‘global warming is a serious and pressing problem [and] we should begin taking steps now even if this involves significant costs’. 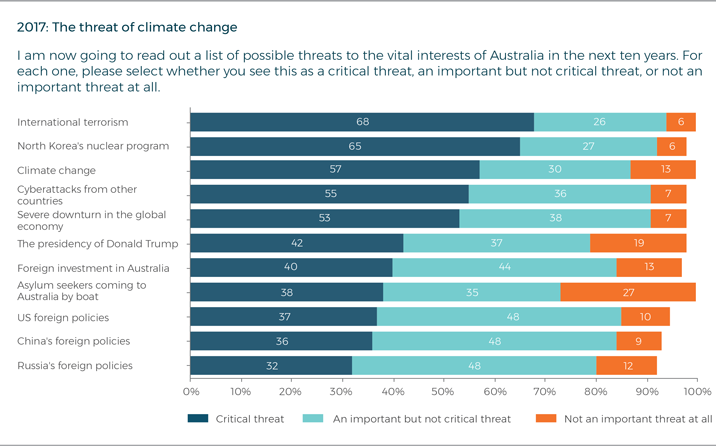 In further results from the 2017 Lowy Institute Poll conducted earlier this year, most Australians (57%, up 11 points since 2014) see climate change as a critical threat to Australia’s vital interests in the next ten years. This places climate change in the top three of 11 serious threats, behind only international terrorism and the nuclear threat from North Korea. More Australians regard the threat of climate change as critical to the nation than a severe downturn in the global economy, foreign investment in Australia, asylum seekers coming by boat, and the foreign policies of China and Russia. In advance of the Paris climate accords agreed in late 2015, Australians were clearly in favour of a strong commitment on emissions reductions from the Australian Government. 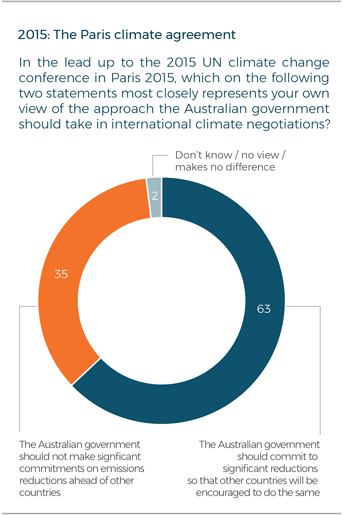 In our 2015 Poll, most adult Australians (63%) said the government should be prepared to make stronger commitments on emissions reductions in the interests of reaching a global agreement. The full set of results from the 2017 Lowy Institute Poll will be released on 21 June 2017, together with the updated poll interactive site at www.lowyinstitute.org. These results are drawn from the 2017 Lowy Institute Poll, a nationally representative telephone survey of 1200 Australian adults, conducted on behalf of the Lowy Institute by The Social Research Centre between 1 and 21 March 2017. 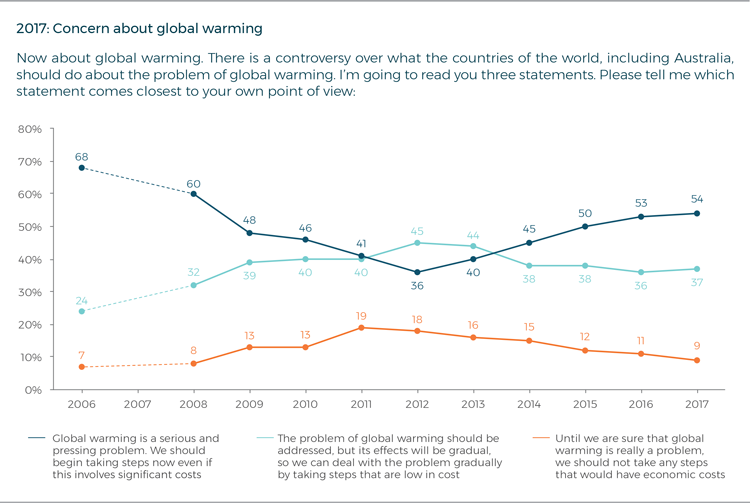 The results on the Paris climate accords are taken from the 2015 Lowy Institute Poll, a nationally representative telephone poll of 1200 adults, conducted on behalf of the Lowy Institute by I-view between 20 February and 8 March 2015. The maximum sampling variance (‘error margin’) of both Polls is approximately +/- 2.8%.